Oh, hello. It’s Saturday morning. What, this is no time to sleep in! Come down to the kitchen, or maybe go outside and find this vending machine, because a simple yawn can earn you a freshly brewed cup of coffee to get the day going. At least that’s the concept behind this yawn-activated coffee machine from Douwe Egberts. The Dutch-based company has designed the vending machine to use facial recognition software and identify people who are tired and in need of a little pick-me-up. 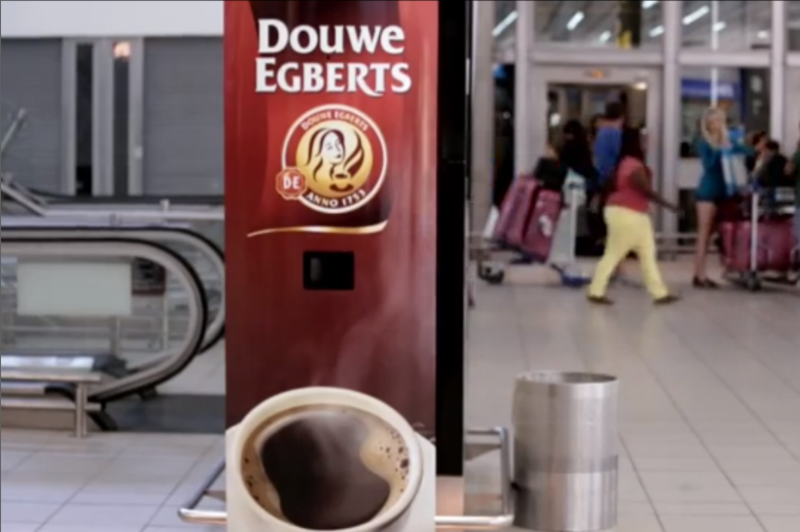 In a marketing campaign adorably titled “Bye Bye Red Eye,” Douwe Egberts installed the machine in a middle of O.R. Tambo International Airport in South Africa and recorded as sleepy travelers wait for boarding. Those who walked up to the machine trying to buy coffee failed; the machine would only dispense a free cup of joe when it saw that people were yawning and clearly needed some caffeine. In this case, you snooze, you win. Big time. Since the facial recognition software can only recognize what yawns physically look like, you can probably try to scam the machine for free drinks with a prolonged open mouth and some exaggerated squints. But think about how awesome it would be to own a coffee machine that made us a cup when it realized we needed one. Hygienically speaking, you will never have to touch a button again, and it’s just sort of nice to think of robots as thoughtful little devices. The Douwe Egberts experiment dispensed about 210 cups of coffee in the airport that day, but leave the machine in the Digital Trends office and we’ll be sure to run through the inventory in no time at all. Send us one, won’t you, Douwe Egberts? Sony's rumored smartphone lens borrows parts from high-end cam, but how real is it?